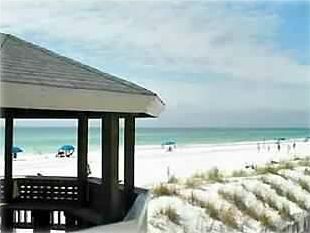 Located at Southbay by the Gulf, a private community of individually owned townhomes in beautiful Destin Florida. This family oriented complex is located directly on the Gulf of Mexico with 300 feet of breathtaking white sandy beach and beautiful emerald green water. Southbay by the Gulf, in the heart of Destin, is located half-way between the Destin bridge and the Mid-bay toll bridge (three miles from each). Southbay is complete with all the amenities: 2 pools with adjoining kiddie pool, 2 tennis courts, and shuffle board, and fully stocked 5 acre fresh spring fed coastal lake. Our home away from home is located just 120 yards from the beach, and has no streets to cross, no high-rise to deal with, less than a minute to the pool and tennis courts, and is an end unit on the south-side of the lake. The kitchen is fully equipped for the finest chef, with ample eating area. Recent renovations and redecorating such as new granite countertops in the kitchen and a new electric grill sets our home apart from the rest. Each bedroom has its own private bath, and comfortable mattresses. Our home is baby friendly and includes a pack-n-play, safety gate, high chair, and outlet covers so you have less to worry about packing. of the water. The children will enjoy feeding the ducks, turtles, and fishing right from your own private deck while you prepare dinner on your own electric grill.